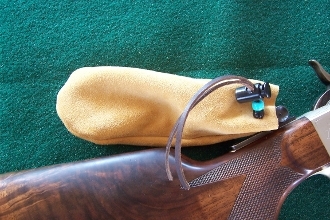 High Quality leather sight covers to protect your precision sights and barrel. Whether shooting in high winds or not, these covers will keep dust and dirt out of your sights and more importantly your barrel. This is a two piece set, one for rear sight and the other for front/barrel cover. Comes with leather strap and locking tab for security with a period correct look. Three colors for you to choose from. You will be pleased with a set of these.